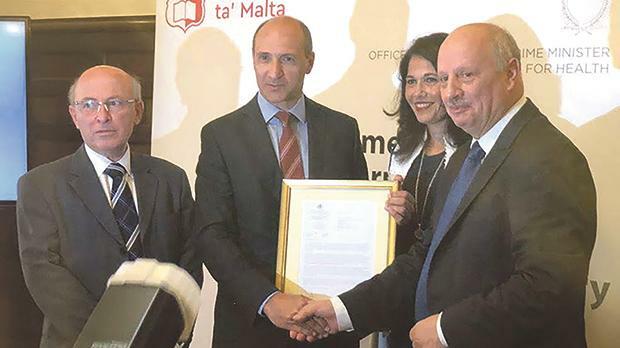 Health Minister Chris Fearne (second from left) presenting the official WHO designation letter to University rector Alfred Vella in the presence of faculty dean Godfrey Laferla and Maria Cordina from the department. The World Health Organisation has designated the University of Malta’s Department of Clinical Pharmacology and Therapeutics at the Faculty of Medicine and Surgery as a WHO Collaborating Centre for Health Professionals Education and Research. These centres are recognised as key institutions with relevant expertise that represent a valuable resource as an extended and integral arm of WHO’s capacity to implement its mandated work.They form part of an international collaborative network that carry out activities in support of the organisation’s programme at all levels. The aims of these centres are to support WHO by conducting research generating evidence on health professional education; to provide technical assistance on education of health professionals to improve health literacy and patient safety; and to participate in jointly planned WHO meetings, promote and disseminate WHO polices and documents. For further information visit the website below.